Emotional strongholds come in all shapes and sizes--doubt, rejection, poor self-esteem, pride, stubbornness, a victim mentality, or defeatism. Which of these are you battling? Which ones are undermining your confidence and eroding your spiritual strength? Tearing down emotional strongholds so they no longer dominate your thoughts and actions can come only through an intentional alignment of your thoughts with God's truth in the Bible. Join Dr. Tony Evans in examining key emotional strongholds and their corresponding biblical truths that you can declare and apply to bring victory into your life. 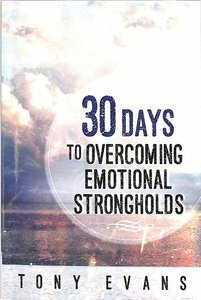 About "30 Days to Overcoming Emotional Strongholds"
Tony Evans is the senior pastor of Oak Cliff Bible Fellowship Church in Dallas, and president of The Urban Alternative, a ministry devoted to bringing about change in urban communities through the Church. He is the author of many books, including Free at Last, The Battle is the Lord's, Our God Is Awesome, Returning to Your First Love, The Promise, Who is this King of Glory? What Matters Most, and The Best Is Yet To Come.- Publisher.